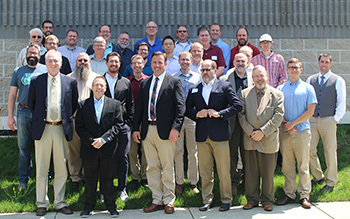 The Ministerial Training Institute of the Orthodox Presbyterian Church (MTIOPC) announces three courses, including a newly developed one, taught by OPC pastors for the Fall semester. Join the first class of the newly developed Ecclesiology: Pastoral Theology course with its new instructor, Craig Troxel. This course compliments Troxel's course on Ecclesiology. Brush up on your Hebrew with A Hebrew Refresher taught by Matthew Patton. Consider becoming better equipped to lead worship that is in accord with the Scriptures and the Orthodox Presbyterian standards by studying Reformed Worship under Glen Clary. Enroll today for a MTIOPC course. Deadline is July 31, 2018. The mandatory Intensive Training will be held Tuesday, November 6 through Thursday, November 8 at Grace Presbyterian Church in Columbus, Ohio. Students, excluding commuters, arrive on Monday, November 5, and leave at 12:30 p.m. Thursday, November 8. Applications are available on the MTIOPC page.